In with the old, in with the new. Albury-Wodonga is the perfect blend of history and contemporary, sitting on the banks of the Murray River. You may be tempted by the tranquillity of the grand Murray River, to wile the day away on the banks with a good book and some wine and cheese. But if you’re up for exploring a bit more, you’re in the right place. Situated on either side of the Murray River, Albury-Wodonga is small enough to enjoy exploring on foot, but large enough to provide a variety of entertainment. There’s plenty of artistic entertainment on offer for visitors to the vibrant twin cities. The local Hothouse Theatre Company regularly performs in the historic Butter Factory, bringing leading artists and plays. There’s also the Albury Art Gallery and Wodonga’s Art Space, both of which feature performances and exhibitions year-round. If you’ve got kids with you, stop by Kidspace at the Albury Art Gallery or make a pit stop at the Library Museum, which offers an interactive story of the Murray River. The kid-friendly Gateway Village has public art and grassy banks for the kids to play. There’s plenty of food options in Albury Wodonga, from picnics on the banks to fine-dining establishments. Adamshurst is a good place to start. One of the grandest buildings in Albury, the once-private residence has been transformed into an elegant restaurant. In Wodonga, you can’t go past Elgin’s with two dining options – Steak Pit Restaurant and Elgin’s Bistro – both which serve up a delicious feast. If it’s wine you’re after, some of Australia’s prime vineyard areas are on Albury-Wodonga’s doorstep, so there are plenty of options to suit any tastebud, including Rutherglen Estates. Prior to colonisation, the Albury Wodonga region was known as Bungambrawatha by the Wiradjuri people. The area itself has become a living preservation of the sites and artefacts of the Aboriginal culture. The rock carvings of Yeddonba near Chiltern, the rock painting of the Tasmanian Tigerby the Duduroa people is at Mt Pilot and Table Top are key sites. You can also learn how to look at the land through Aboriginal eyes with the help of a guide and archaeologist. While a beautiful place to visit, Albury-Wodonga is also the perfect spot to base yourself while you explore the surrounding regions. Take virtually any road out, and you’ll be entering a different landscape, with a different culture, history and heritage in each and every direction. Head north for farms and picturesque country towns. East takes you to the rugged, untamed, natural wilderness and the valleys of the Murray region. Want to experience the Gold Rush? Just head south. There are also wineries, forests, and the Victorian Alps. There are varied options when it comes to accommodation, catering for different needs, tastes and budgets. After a retreat? 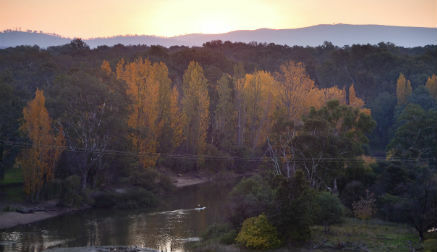 Head to the Upper Murray Resort where the hills meet the river. The resort offers sweeping views over the countryside and a private cottage. There’s also the Quality Siesta Resort in Albury with stylish accommodation and a beautiful lagoon-style pool. There are plenty of bed and breakfasts if you’re after a bit more human interaction. Cabins and caravan parks are available for the more adventurous and self-contained apartments are the way to go if you prefer a more homely atmosphere. Why not head to Albury-Wodonga with friends? This year, the Probus Rendezvous is on the banks of the Murray. The more the merrier!